It sure was ugly out there today. The $DIA registered its first 500 down day in who knows how long, and everything that was oversold became, well... more oversold. So what to do after a day like this? Do we sit and brood over what could have been done, how you should have loaded up short or stopped out of your longs? We need to focus on what will make us better traders, and what will help us restore our psychological capital. Because the worst thing you could do here is go on tilt. 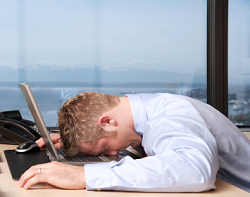 Staring at news reports, brokerage statements, and charts for the next 6 hours will not help you. At all. After a certain amount of time, diminishing returns start to set in, and that extra hour of time spent analyzing the $VIX won't help you in your trading. So grab an egg timer and set it for 45 minutes to 1 hour. After that sucker rings, turn off the screens. Physical activity is a great way to relieve stress. It's beneficial to your cortisol levels, will give you more energy, and gives you an outlet in which you can focus on something else other than whether $AAPL will break down or not. When traders go on tilt they tend to beat themselves up, which creates a negative feedback cycle that can lead to larger losses. To break this cycle, recognize that a trader is not defined by wins and losses, but by processes and consistency. So go out and pick out something that is a luxury consumable expenditure for you. It can be a nice bottle of wine, gourmet ice cream, or a pedicure. It's incredibly important to decouple your self worth from what the value of the Dow. No, don't go pick up some Ramen noodles and brood over CNBC. Go eat dinner. That's right, sit down with people you care about and have a slow meal that requires you to talk to people. No screens, no noise, just develop relationships. This is a key to happiness that leads to value decoupling as well as a way to mentally reset yourself for the next trading day. This isn't any sort of hippy nonsense, it just is a way to clear your mind. I am a big fan of Vipassana meditation, where you don't have to recite incantations or any other requirements that may seem uncomfortable for westerners. To learn more about this, check out "Mindfulness in Plain English" [pdf]. Pick and choose which ones you like, I guarantee your trading and analysis the following day will be much clearer and profitable than if you had devolved into more destructive habits. Do you have a routine that you think will help others on days like this? Let me know in the comments section.